Merriam Webster defines control as "To exercise directing or restraining influence over." And while I'd like to think I am not a "control freak," I must confess there are times I am THAT type of person. I expend an enormous amount of energy trying to bend and shape every situation to align with my desired result. As you know, that is exhausting, frustrating, and rarely leads to the best outcomes! It's so draining to try and force people to think and act exactly like I do. With people I have to remember it is about earning trust and having respect for their perspectives and insights. Instead of trying to pound them with persuasive words, I more frequently need to listen to understand, focus on their needs, and be willing to sacrifice when necessary to come up with a mutually-beneficial solution. A plan gets me started, but rarely gets me to my destination. And it almost never happens in exactly the way I intended. I have to expect plans to change, and for mistakes to be made. As long as I am making imperfect progress toward my professional and personal goals, however, I should stop stressing about the outcome not shaping up exactly as I previously planned. When I am so focused on controlling the future, I rob myself of the potential of the present moment. I really like what Dr. Spencer Johnson writes in his book, The Present: What is RIGHT now and What is right NOW? I need to recognize what is positive about the present moment and what opportunities exist in the present that I may not have in the future. When I do these things, the uncertainty of the future becomes less important. Where do you need to be less of a "control freak" this week? 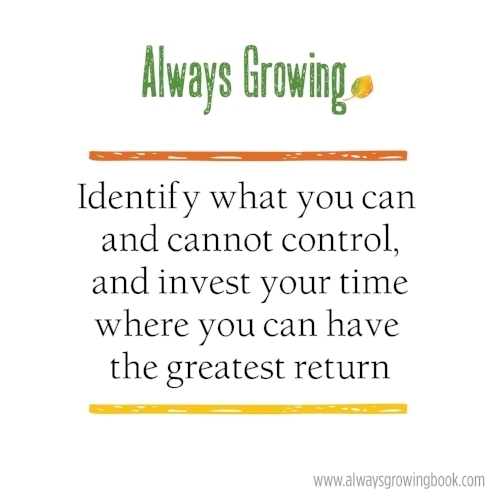 For more about what you can control as a leader, check out my new book, Always Growing.